Did Akash Ambani, Son Of Mukesh Ambani, Kill Two People In A Road Accident? 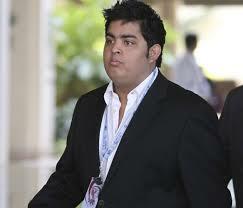 It is being speculated that son of Mukesh Ambani, Akash, was responsible for a road accident in Mumbai that killed two. The accident took place on December 8, 2013. Probably that’s when the limelight hit the spot. During the wee hours of Sunday, December 8 2013, a black Ashton Martin Rapide (registration # MH 01 BK 99) belonging to Mukesh Ambani’s Reliance Ports, crashed into an Audi and a Hyundai Elantra, at Pedder Road, Mumbai. That’s estimated to be a 4.5 crore rupees worth of (now) scrap metal. The crash killed two people. There was NDTV coverage, Bussiness Standard articles and other ambiguous reports which informed about the apparent details of the car crash; More recently, some news pieces have been making rounds on how the Mumbai police was not keen on arresting one of Reliance’s driver, Mr. Bhansilal Joshi – who, as per Reliance, was driving the car at that time. News channels such as Zee 24 Taas claim a ‘fully drunk’ Akash Ambani was at the wheels in the car when the accident took place. Mainstream media apparently has decided to keep mum on this news. The confession of the 55-year-old driver didn’t ensure his arrest. Yet. Himanshu Roy, joint commissioner of police, Mumbai crime branch allegedly said that the matter ‘did not belong to crime branch, but was under jurisdiction of the local (Gamdevi) police station’. Eyewitnesses of the accident claim that a young man, who apparently looked like Akash Ambani, was seen on the driver’s seat. The eyewitnesses claim that the driver fled the accident spot in one out of the two SUVs that were following the Aston Martin. The police has taken fingerprints and DNA evidence from the car, which won’t do much good – media pictures and video footage shot by Zee TV soon after the accident show many people touching the inside of the car. A number of Mumbai-based newspapers, including the tabloid Mumbai Mirror, have already pointed out that it was Akash Ambani – son of the richest industrialist in the country, Mukesh Ambani – who was on the driver’s seat when the accident took place. Signals from the mobile tower point out that Bansilal Joshi was not present at the time of the accident. The car was last seen at a bash organised by Mukesh Ambani in the honour of cricket legend Sachin Tendulkar, at which Akash Ambani was also present. Believe it or not there are apparently two casualties of this crash and one can’t find a peek about it anywhere. NDTV recently adjudged Mukesh Ambani to be one of the 25 Greatest Living Legend in India and the event was organised at Rashtrapati Bhavan. Would the Rastrapati Bhavan be open for private-invite only parties in the future, or was it that Rashtrapati Bhavan made an exception and obliged NDTV because of President Pranab Mukherjee’s long-standing association with the Ambani family? Why is the media silent on this matter, which has not invited a single biting comment from either the Congress or the BJP, with the sole exception of a tweet by J&K chief minister Omar Abdullah? Will Arnab Goswami speak up NOW? The nation really needs to know. Isn’t it our right to know who was behind the wheels of that Aston Martin? Isn’t it the right of the families of those who died in this accident to know who was responsible for the death of their loved ones? Forget individual rights, is it right of anyone who is trying to put a cover on this incident? And the fact that news outlets have either blocked this story or completely ignored it is truly nauseating. Let’s not be hypocritical. Let’s not. We all know who did this but money not only talks but it can buy you pin drop silence! Life is given by god. and can be taken by any 1. It is shown by this laws are not equal for every one. God bless all. i know signing petition and all do nt help,but cant we do something about it..cant we get justice for those two innocent people.Justice will happen if we want it.